Case IH has launched new versions of their popular tractors, which includes ten new Case IH Steiger, four new Quadtrac and five new Magnum tractors. The new versions will include more powerful engines with the Steiger and Quadtrac 600 tractor at 600 engine Hp (670 peak Hp) and the Magnum 340 at 340 engine Hp (389 Hp). Case IH has taken the opportunity to improve engine performance thanks to the global initiative for a new range of high horsepower tractors to suit the introduction of new emissions regulations in North America and Europe. Case IH has also used this opportunity to build in a multitude of new features and improvements – from the chassis to the cab and user controls. New family engines from corporate partner FPT Powertrain Technologies, with two six-cylinder in-line 24 valve engine platforms at 8.7 and 12.9 litres. 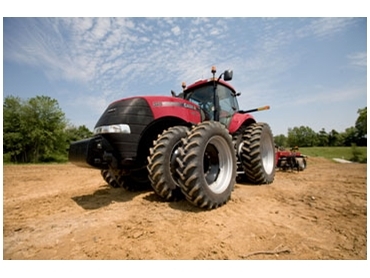 Both feature advanced technologies for maximum performance in demanding agricultural applications. Fully electronic high-pressure common rail fuel systems, giving the tractor engines faster response to changing loads even at lower rpm. For Magnum tractors the Power Growth under full load averages 13 – 14 percent, with Power Boost up to 35 engine Hp. For the Steiger tractors, the Power Growth averages 10 percent or up to 70 Hp. For the Steiger 600 that would be 670 peak engine Hp. The new Case IH Steiger, Quadtrac and Magnum tractors are non-SCR (Selective Catalyic Reduction) machines (with exception of Steiger 350 Hp), the model cabs sit four inches taller to provide an enhanced view over hoods and new frameless doors that seal more tightly and are easier to open and shut. They also feature a new optional four-point cab suspension that uses springs, shock absorbers and torsion bars to help provide a comfortable ride that is controlled laterally as well as vertically. The new versions of the Case IH Steiger, Quadtrac and Magnum tractors will be arriving Australia in the second half of this year 2011.